Upon graduation from MIU with an MA in Education in 1981, there was no PhD program other than NeuroScience. 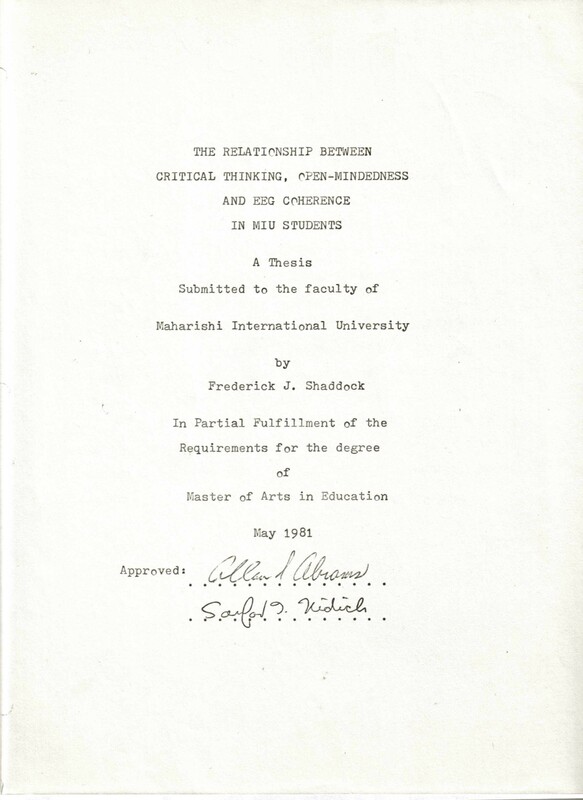 My thesis was supervised by Dr. Alan Abrams, one of the first statistical analysts working with George Ellis in the TM based prison projects, and Dr. Sandy Nidich. My thesis included 3 studies. 1. Administer the Rokeach Adult Dogmatism Scale to MIU freshmen and seniors and compare them to national norms. Dr. Miltion Rokeach of the University of Michigan designed a scale. My hypothesis was that MIU students would be about the same as students at other universities. On one hand they were open minded enough to go to MIU. On the other hand (as you know) there is some degree of dogmatism in the Movement. Surprisingly both MIU freshmen and seniors were way on the open minded end of the scale. This study was included in the MIU Self Study for Accreditation. 2. Administer the Watson-Glaser Critical Thinking Appraisal to MIU freshmen and seniors. This included subtests in Inference, Deduction, and Ability to Recognize Unwarranted Assumptions. My hypothesis was again "no difference" with national norms. Freshmen scored about the same as freshmen at other colleges (48%). Seniors scored in the 85th percentile. But it may have been a unique class. In 1984, to see if there was a longitudinal change, with the help of Dr. Sandy Nidich we tried to find enough freshmen who were still at MIU as seniors. I was busy in Washington DC with my computer work, and provided Sandy a fund to offer the students $5 to take the rather boring test. But we could only find about 12 of the students still at MIU, so we would not be able to draw any valid inferences. 3. 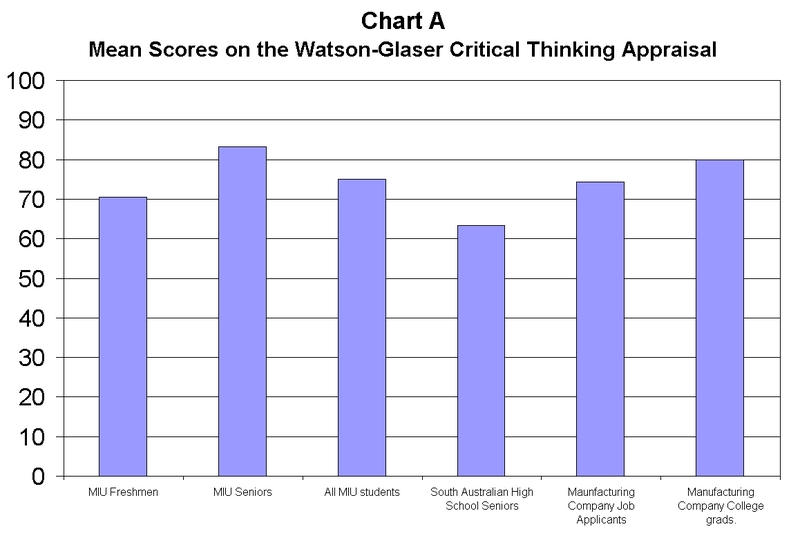 Compare scores on the Watson-Glaser Critical Thinking Appraisal to EEG scores in students. My hypothesis was that there would be a positive correlation between this aspect of logical reasoning, and left hemispherical brain wave coherence. There was a slight, but statistically insignificant, correlation.